Every so often you end up with or around a cat who has some odd habits that may seem confusing. Things like staring at their owners without looking away, needing to eat near their owners, pressing their paws into random objects or “making muffins”, rubbing their face on everything and sitting on paper are just a few of the most common habits cats have that are confusing. One of the most confusing traits we have experienced with our youngest cat, Kalista, is the fact that she likes to chew on our fingers. 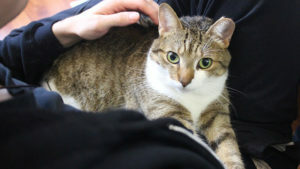 Kalista is a sweet girl who loves to cuddle, play and is spunky and high energy. Thing is, every so often she will come to lie down on one of us and begin chewing on our fingers. Although we’re not very concerned with this behaviour and don’t really mind it, it is important for us to understand where it comes from. A lot of times cats develop habits or behaviours to help their owners understand what it is they want or need. That being said since Kalista was always a picky eater we originally thought that it might stem from her being hungry because she didn’t have enough food in her last feeding. This quickly brought on the joke that Kalista would prefer to eat human flesh over chicken, though in reality, Kalista has never broken skin while giving us little nibbles on our fingers. We then bought Kalista a variety of chew toys which seemed to captivate her attention, but it still didn’t stop her from giving us little nibbles every so often, showing us that there were times where she just wanted to chew on something and other times when it was important that she was chewing on us. 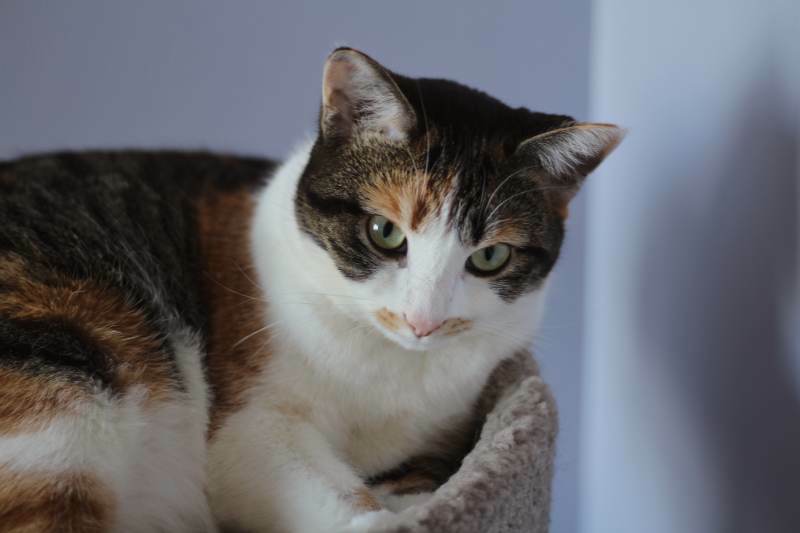 So, what are the reasons why Kalista chews on our fingers and what are some of the reasons your cats may be chewing on your fingers? Photo from How Many Teeth Do Cats Have? Do Cats Lose Teeth? How Can I Take Care of Their Teeth? Cats are very similar to humans in the sense that they lose teeth, can develop dental diseases and in general, can have sore gums for a variety of reasons. When our gums hurt we tend to brush our teeth more frequently, floss more regularly, drink or eat cold beverages, or visit the dentist. Thing is, our cats don’t have the luxury of all of those options and oftentimes don’t have any other ways of expressing their discomfort. If your cat is between the ages of 1-7 months there is a big chance that they chewing on your fingers because they are teething. During this stage, you may want to switch over to wet food to ensure that your cat does not experience any difficulty chewing. Dependant on the cat, kibble may be a bit too rough for them, causing more discomfort and can even cause them to stop eating altogether. 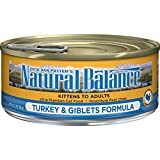 Now, this isn’t something to be overly concerned about and if your cat is happily eating kibble and showing no signs of discomfort there is no need to switch over. If you notice your cat spit out their food or hear them whine/whimper while eating this is usually a sign that their gums are sore and they need some relief. 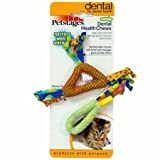 Other than wet food you can try a series of rubber chew toys such as the Petstages Dental Kitty Chew Wheel or even a baby pacifier. I personally recommend throwing these into the freezer for extra relief. Take a look at your cat’s gums and first assess whether or not they are developing any dental disease. Cats are most commonly known to develop Gingivitis which usually manifests with inflamed gums. Gums affected by gingivitis will appear dark red, where the gum meets the teeth, and may even bleed periodically. If gingivitis is left untreated your cat may be in for some tooth rot which often results in teeth pullings. Gingivitis can only be treated by a veterinarian but can be avoided. Brushing your cat’s teeth can help sooth/maintain your cat’s teeth and gums, and you can look into getting toys that help floss your cat’s teeth. Alternatively, you can try feeding treats that are bigger in size in hopes of having your cat chew on them (in turn scraping the tartar/plaque off their teeth.) 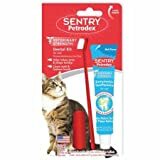 I will say this is the least effective way to keep your cat’s teeth clean as it is essentially using food to clean your cat’s mouth of food, however, it helps aid in the teeth cleaning process. 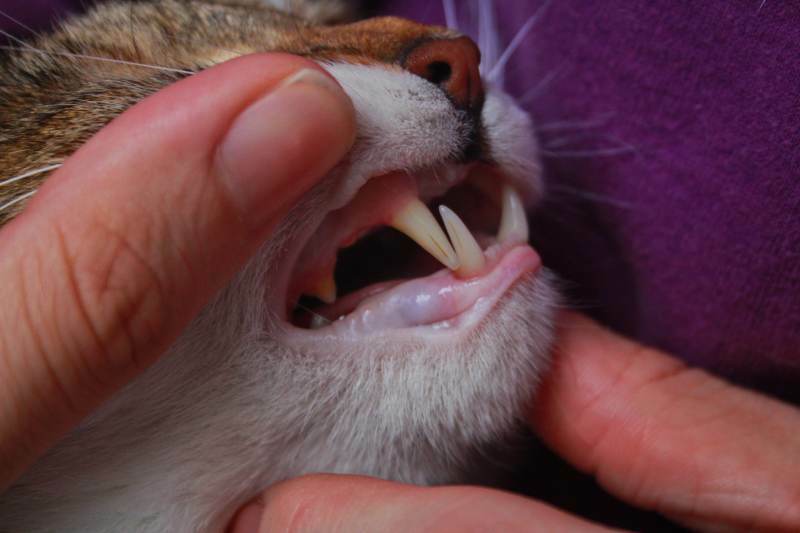 I would recommend speaking to your vet about your cat’s sore gums as they may recommend you implement methods of keeping your cat’s teeth clean. 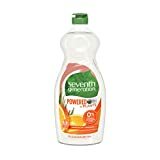 They may also recommend some water additives that are meant to help aid in the cleaning process. Have you ever craved a specific type of food for its texture and not its taste? I know I do. Grocery shopping when I’m craving certain textures of food can be annoying, especially when you don’t know exactly how soft you really want something or crispy. How rigid do I want the chips? Do I want Nachos or do I want some Fritos Lays? Well, the same thing can be said about your cats! It’s easy to assume that only kittens like to chew on soft objects, but some cats have the desire to chew well into their adult lives. 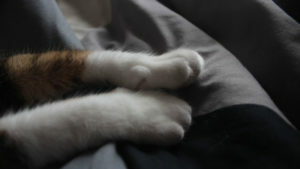 If you’ve noticed that your cat is choosing your fingertips based on their texture (ie. you’ve provided them with chew toys that they use infrequently or ignore) you may want to find something similar to let them chew on. 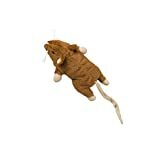 Our favourite cat toy is the Big Bertha Mouse. MY CAT WON’T USE THE TOYS AND I DON’T WANT THEM CHEWING ON ME, WHAT DO I DO? Similar to dogs and other small mammals, cats can be trained to stop certain behaviours that are not instinctual. A good practice to teach your cat that you are not interested in being chewed on is saying something like “uh-uh” to them. I personally do not believe in teaching your cat or dog the word “no” since it’s so commonly used in day-to-day life and may cause them to think you are scolding them when you’re not talking to them. That being said, you can choose a sound or phrase that doesn’t commonly come up in conversation to let them know you’re unhappy. It’s also a good idea to take your hand away and pretend to be more hurt than you actually are. This will help solidify that you are telling your cat that biting actually hurts and your cat may even begin licking you as an apology for hurting you. As soon as you take your hand away give them the toy you would like them to chew on so they can begin to understand that it’s not chewing that you’re bothered by, but being chewed on. 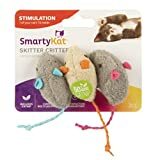 This will also help them associate the urge of chewing to this specific toy similar to knowing that a specific location is where they are fed. I LOVE YOU HUMAN, WHAT DON’T YOU UNDERSTAND? Sometimes our cats just don’t know how to express their love in a way that we humans find acceptable. While yes my cats love to cuddle and sleep with us our youngest, Kalista, finds it appropriate to bite us ever so lightly whenever she wants attention. Kalista will begin by rubbing herself against our legs and if we don’t pet her immediately she will take a nip at our legs. She also does this if you stop petting her and she is sitting in your lap. It’s her way of saying, I’m not done, so you have to keep going! So why do cats choose to bite us, especially if they’ve already scented us? Well, why do you give your partner love bites or hickeys? Love biting is a social phenomenon that a number of animals participate in. It is believed that it stems from being able to trust someone so much you can let them bite you without the fear that they are going to hurt you. I feel you, sometimes Kalista’s biting can get quite annoying, but you want to be a bit more careful when disciplining cats who like to love-bite. In general, you always want to avoid physically disciplining your animals, not only for ethical reasons but for the mere fact that cats easily learn to not trust their owners. Well, the thing is… just because you don’t smell it doesn’t mean your cat doesn’t. Cats have a very sharp sense of smell and it is very likely that they still smell the meal you just had or had a few hours ago. That being said, a common reason why cats chew on their owner’s fingers and lick them immediately tends to do with the fact that there is still residue on their fingers. Cats are meticulous cleaners and often overgroom themselves to ensure that they do not smell like meat so their predators don’t know they are around and their prey doesn’t know that they are coming. Well, even though younger me couldn’t master the skill of masking the fact that he just had drumsticks, older me has found that using scented soaps does help deter your cat from chewing on your fingers. That being said, not every cat is the same and some may not care whether or not you washed your hands with something fruity. 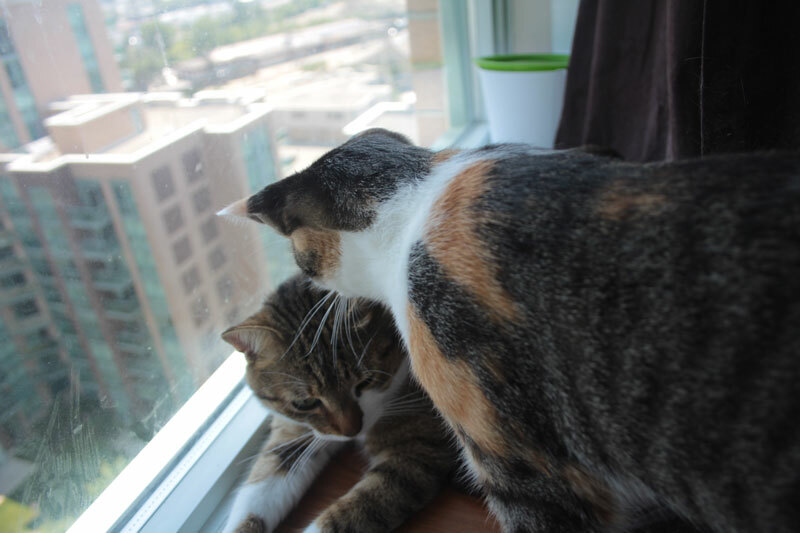 Photo from Why Do Cats Lick & Groom Each Other? Does It Mean They Like Each Other? Cats are fairly active animals and even though they like to sleep a lot they do get burst of energy, especially during the night. Sometimes playful cats will nip at you, or even chew your fingers to let you know that they want something to do. For cats like these, I usually recommend small mouse toys that they can chew on and kick around. 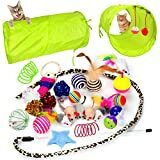 Make sure they are light-weight so they can bounce around the house and keep your cat occupied and entertained. 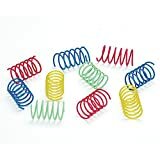 You may also want to look into buying your cat some springs. They’re very inexpensive and I’ve bought dozens of packs just in case they ever break from me vacuuming them up. 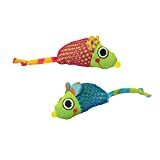 These are by far Kalista’s favourite passive toy and she will run with one in her mouth throughout the day. This week I even found 4 in our bed… Kalista just can’t get enough! A lot of time stressed cats who suckle or chew fingers also have a disease called Pica. 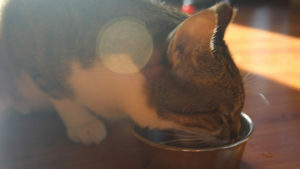 Fret not, even though Pica is classified as a disease it is very manageable and one of our cats, Beau, actually has it. While there are different causes for Pica, some of the most common reasons are stress and anxiety. That all being said, if you notice your cat suckling on wool objects and nibbling at your fingers try to scout of what may be stressing them out. 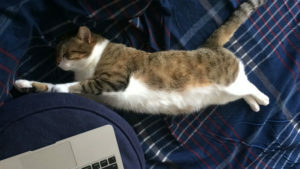 Cats, being much smaller than us, tend to get stressed out more easily from loud noises, other animals in the house/building or even by new scents. Other causes of stress include, but are not limited to, a change in diet, a change in the layout of their home, a change in litter or even their owner being out for too long. Make sure your cat has plenty of places to hide or stay safe. Things like pet beds, cat trees, blankets or even cardboard boxes are ideal. Many cats feel safest when they are high up so they can scout out the room for predators, while others enjoy closed off spaces such as cat huts or cardboard boxes as it makes them feel secure. Something that worked really well for our family is soft instrumental music, which is something that really helped us when we first adopted Kalista and while Beau was recovering after his Perineal Urethrostomy. You can also try out Feliway which is a product that is supposed to mimic the pheromones a queen (mother cat) produces while she is feeding her litter. Feliway is commonly recommended by vets and although it has worked for a number of my friends, it didn’t work for our cat Beau. 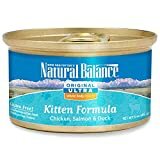 That being said, I would buy a small quantity at first to try out for 30-days to see if there are any improvements with your cat (as Feliway can also help discourage a cat from other bad behaviours such as marking and destructive behaviour. Although it might be confusing at first why cats choose to chew on your fingers, there are plenty of explanations for why they do it. Since cats don’t have the ability to speak a verbal language we understand, they often have to resort to actions that help us understand what it is they need and want. Most of the reasons a cat would nibble on your fingers are positive and shouldn’t raise any concern, however, if the cause of chewing stems for sore gums or stress you may want to take your cat to the vet as soon as you can to get them checked out. So pet parents, do any of your cats chew on your fingers? What’s the reason they do for you? 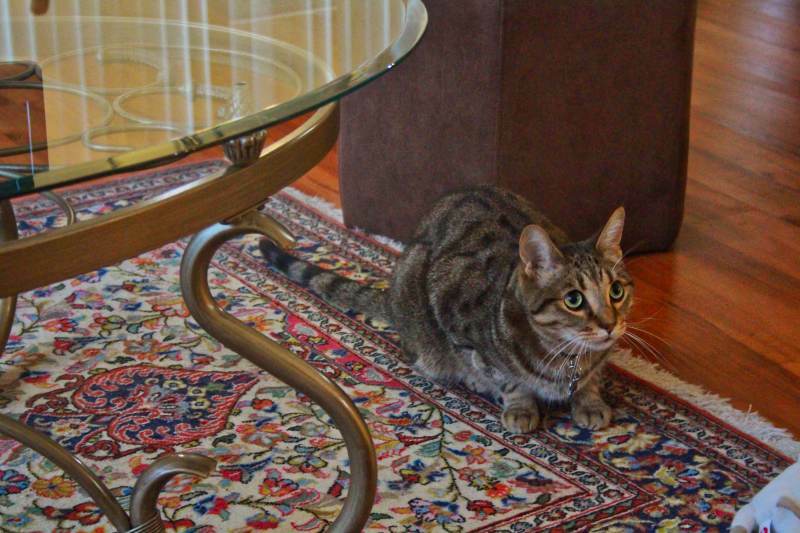 My Cat Only Wants to Eat near or Next to Me While I Watch… Is Something Wrong? 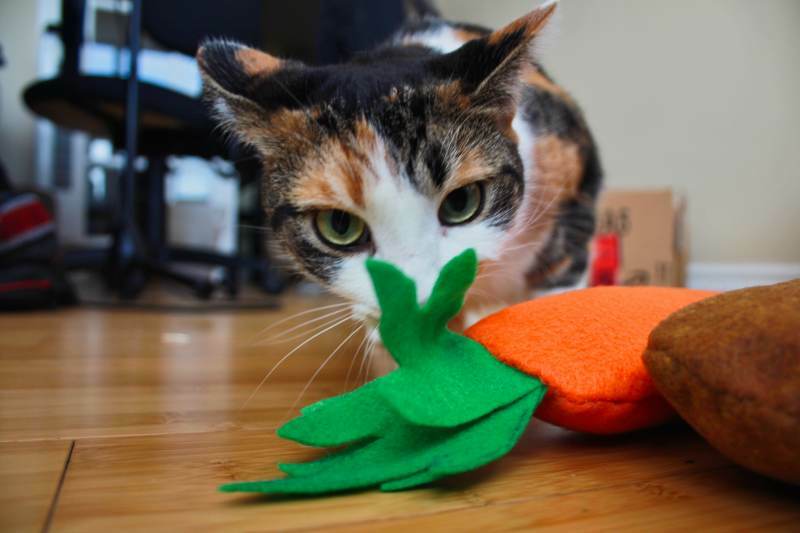 What is Pica in Cats & How Can I Help My Cat Stop Chewing? This is interesting because we have a box that Ellie is dedicated to destroy. I’ve never seen her like that with anything else – though she’s often chewed things she loves. Maybe it’s her stress talking. At first, I just laughed, but a few days ago, I started to suspect a behavioral reason. That’s really interesting. Have you noticed any other signs of stress?